Ryan Switzer is some kind of guy. In July 2012, he was diagnosed with colon cancer. Yet, just last week, the 37-year-old from Raleigh participated in the IRONMAN competition in Louisville, KY. 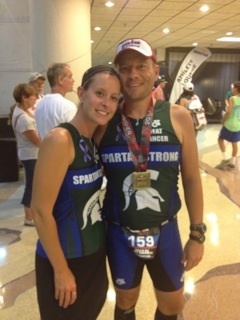 He also raised $5,000 for the Holt Brothers Foundation through his IRONMAN fundraising page. We got to know a bit about Ryan because his two girls attend Camp Kesem and the KidsCan! program at the Duke Cancer Center – two programs supported by the Holt Brothers Foundation. KidsCan! provides peer empathy, emotional support and inspiration for kids who have a parent with cancer. Camp Kesem is a sleep-away camp for kids who have a parent with cancer. It gives them the chance to forget their troubles and just be kids for a week. Ryan went through chemotherapy and radiation treatment and has had several surgeries. He’s going back into the hospital for another surgery in a few weeks. He’s positive, upbeat, and optimistic about the future. His story is an inspiration and it’s why my brother Terrence and I give back to the community through our Foundation. We want to help families like Ryan’s. Talk about someone who deserves hero status. He’s the man in my book.